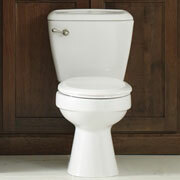 ProSource® of Dayton has all you could need for a bathroom remodel. From the tiniest of details, like which sink faucet to choose, to the larger pieces, like finding the right bathroom vanity, we’re here for you. Come into our showroom today and find the products and advice you need to remodel your client’s bathroom in a way and at a price that they’ll love. No matter the space restrictions or personal preferences, we have something to match your clients’ needs. With plenty of vessel, wading pool, and pedestal sink options — and more! — we can help you find what will work for your client. 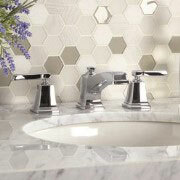 The personalization of your client’s bathroom sink will seem endless when you throw in all the options for bathroom faucets. If they’re wanting modern or traditional, lever or oval, or even just an explanation of all the different options, we can help. Showers should be a place of relaxation, but old grouting or leaky shower heads can diminish that. When your client needs a shower remodel, we have all the products to transform their shower into the warm oasis it should be. 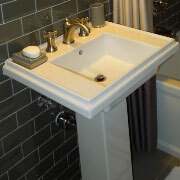 If your client’s bathroom vanity needs an update, we have plenty of options to accommodate their style and budget. 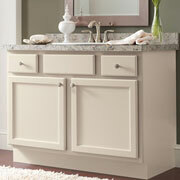 Our free-standing and built-in vanities include everything from storage to counter space to lights. 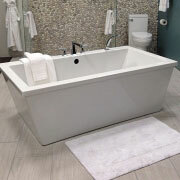 Whether your client is looking for a jacuzzi tub, shower-tub combo, or something else entirely, we have the products to help with the bathtub remodel. Meet with one of our design experts to hone in on what exactly your client wants and how we can meet that. The throne of that bathroom needs some attention, too! When your client needs a new toilet, our specialists can help determine what bowl size, flush rating, or flush mechanisms will best suit their needs.